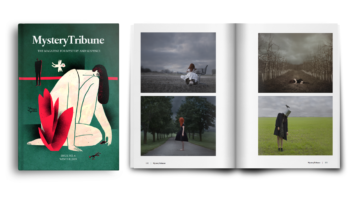 Our 240 page Issue Nº8, Winter 2019 edition of Mystery Tribune is a must-have featuring Hester Young, SJ Rozan, Hilary Davidson, and Ryan David Jahn. A curated collection of short fiction including stories by Hester Young, Edgar Award Winner SJ Rozan, Hilary Davidson, Ryan David Jahn, Edgar Award Winner Gary Earl Ross, Jonathan Ferrini, Kevin R. Roller, and William R. Soldan. Interviews and Reviews by Charlaine Harris, Charles Perry and Nick Kolakowski. Art and Photography by Brittany Markert, Anka Zhuravleva and more. This issue also features a preview of the new The Wrath Of Fantomas graphic novel by Olivier Bocquet and Julie Rocheleau. NY Times Bestselling author Reed Farrel Coleman has called Mystery Tribune “a cut above” and mystery grand masters Lawrence Block and Max Allan Collins have praised it for its “solid fiction” and “the most elegant design”. An elegantly crafted quarterly issue, with a beautiful layout designed for optimal reading experience, our Winter 2019 issue will make a perfect companion or gift for avid mystery readers and fans of literary crime fiction.